One-piece, machined aluminum block converts AR-15 lower receiver to 9mm. Compatible with all, Colt-type, 9mm upper receivers, the feed ramp is cut for reliable feeding with all types of ammo, including hollow point and frangible ball. Roller retention device holds block securely in receiver, prevents accidental release. Hardened steel ejector, feed ramp and bolt hold open give long service life; last-round-hold-open feature on bottom-loading model works when used with Colt magazines. Also works with modified UZI magazines but last-round-hold-open will not function. No receiver modification required. Top-Loading Block installs from the top of the lower receiver and Bottom-Loading Block installs from the bottom of the lower receiver. SPECS: Aluminum, black, matte finish. Ett stykke, maskinert aluminium blokk konverterer AR-15 lavere mottaker til 9 mm. kompatibel med alle, Colt-type, 9mm øvre mottakere, mate rampen er kuttet for pålitelig mating med alle typer ammunisjon, inkludert hul punkt og frangible ball. Roller oppbevaring enheten har blokk sikkert mottakeren, hindrer utilsiktet utslipp. Herdet stål ejektor, mate ramp og bolt holder åpent gir lang levetid; siste-runde-hold-åpen funksjonen på bunn lasting modellen fungerer når den brukes med Colt magasiner. Også vil arbeider med endrede UZI magasiner men siste-runde-hold-åpen ikke fungere. Ingen mottaker modifisering påkrevd. Top-Loading blokk installerer fra toppen av den nedre mottakeren og bunn lasting blokk installeres fra bunnen av den nedre mottakeren. Spesifikasjoner: aluminium, svart, matt finish. Function has been 100% with 1000+ rnds of misc ball and long ogive HP ammo in following setup, Spikes lower, Spikes 9mm buffer, RRA Upper with CMMG ramped 9mm bolt and CMMG barrel, Metalform, Colt and Spikes mags. Installation is easy as long as you are comfortable performing basic assembly on an AR lower as the bolt catch must be removed and reinstalled. Works just as well as my dedicated Colt. Mileage may vary depending on the quality of your lower. Works well with C product metal form mags. Drop in is easy to take in & out if your swapping uppers. I did have an issue with the mag catch not poking out enough to grab the magazine. I went with a 9mm Mag catch and then had to take material off the base by the post. This caused it to can't into the wag well more with success. No fault of the drop in. As the headline says, this block fits and works great and the finish is fine. 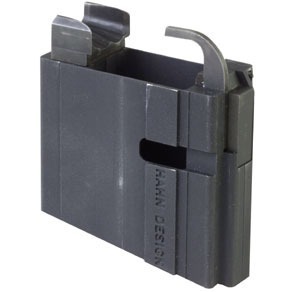 The Metalform 32 round magazines slide in and out and lock in place smoothly. The rounds feed and eject perfectly and the bolt locks open when the magazine is empty. I bought this to use in my SBR lower with a10.5" upper. Functions perfectly with metalform mags with 3 different bullet weights. Easy in and out in about 3 min. At the same time I bought a designated 9mm lower for a 7.5" pistol. Nothing but malfunctions using the same mags. Produsentnr. : ARCPRB0402 Ett stykke, maskinert aluminium blokk konverterer AR-15 lavere mottaker til 9 mm. kompatibel med alle, Colt-type, 9mm øvre mottakere, mate rampen er kuttet for pålitelig mating med alle typer ammunisjon, inkludert hul punkt og frangible ball. Roller oppbevaring enheten har blokk sikkert mottakeren, hindrer utilsiktet utslipp. Herdet stål ejektor, mate ramp og bolt holder åpent gir lang levetid; siste-runde-hold-åpen funksjonen på bunn lasting modellen fungerer når den brukes med Colt magasiner. Også vil arbeider med endrede UZI magasiner men siste-runde-hold-åpen ikke fungere. Ingen mottaker modifisering påkrevd. Top-Loading blokk installerer fra toppen av den nedre mottakeren og bunn lasting blokk installeres fra bunnen av den nedre mottakeren.